A beautiful cover that encloses a wonderful story. 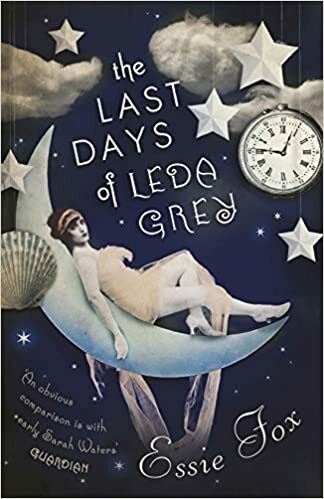 Plotted with impeccable precision, The Last Days of Leda Grey takes the reader back to Edwardian England and the beginnings of the first silver screen films, starring beautiful Leda Grey. Jump to 1976 and journalist Ed Peters has come to Brightland (which I think is really Brighton) where he’s mesmerized by memorabilia he finds in an old junk shop as he sets his eyes for the first time on pictures of Leda Grey. To his surprise, he discovers that this entrancing actress is still alive and he is determined to track her down. Leda’s brother, Theo, tells him where to find her—in a derelict old house off the beaten tracks where no-one ever goes. And there she is: old and decrepit like the house but still possessing the enchantment and fragility of the old days when Charles Beauvois first filmed her. Ms Fox evokes the image of the decaying old house where, for Ed, all is smoke and mirrors. With her lyrical prose, I found myself in the dream-world of cinematic props and tricks. Together, Leda Grey and Ed watch The Mermaid, which stars Leda in all her fantastic celluloid glory. Along with the silent black and white films they view, the story rolls along at the same rhythm: sometimes smooth, sometimes jerky, but always with the same ethereal magic that leads to a most unexpected ending. The Last Days of Leda Grey is a spellbinding novel where all may not be as it seems. Ms Fox’s unique way of writing is a delight to read, and I often found myself re-reading parts so that I could enjoy her turn of phrase again. She is the master of atmospheric writing which ensured that I thoroughly enjoyed her latest novel. Thank you to NetGalley for allowing me to read The Last Days of Leda Grey.